Route 34 East /Downtown Crossing Redevelopment: The Route 34 corridor was conceived in the 1940s by the State of Connecticut and the City of New Haven as a highway link to and from the Lower Naugatuck Valley. The construction of this corridor in the 1950s separated the downtown from the city’s Medical District, major Amtrak station, and the historic Hill neighborhood. Downtown Crossing - the plan to convert Route 34 from urban access highway to a boulevard tied together by a string of development parcels that spanned the previous highway median - was critical to stitching the city back together again. The Plan aimed to transform this depressed limited access highway into a pair of pedestrian-scale city streets, reconnecting the downtown to the Medical District and the Hill neighborhood. NP provided the economic and real estate analysis for this plan that was used to support redevelopment efforts and the material for a $65 million TIGER grant. In addition, NP provided support to the city during the transaction and regulatory approval process for the development of Alexion Pharmaceuticals corporate and R&D headquarters along the newly reconnected College St.
​Innovation Places: NP assisted with the city’s recent Innovation Places grant submission to CTNext, a statewide program that seeks to “support entrepreneurs and leaders developing places that will attract the talent high-growth enterprises need. Young people and innovative organizations want to be in dense, vibrant, walkable places with public transportation and a mix of uses.” The work of Downtown Crossing and Downtown to the Hill had started the city on creating the type of place envisioned in this program. As part of the submission process, NP prepared a Strategic Plan for the Elm City Innovation Collaborative, a broad-based stakeholder group created to inform and govern the process. NP assessed local assets and capabilities, provided a labor shed analysis with a focus on knowledge intensive industries, designed stakeholder and public engagement activities, and prepared a Strategic Plan, which served as the foundation for the grant application. As a result of the work, New Haven was designated an Innovation Places recipient, and awarded $2 million in state funding. In addition, the process helped identify and commit approximately $3 million in local and institutional match. 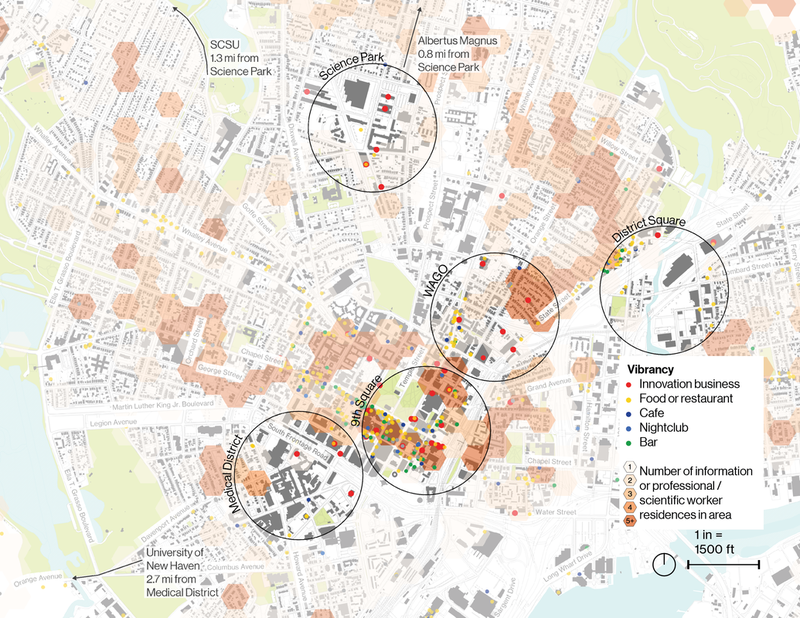 NP directed the creation of a series of maps to understand relationships between institutions, workers and community amenities for Innovation Places.